Today we find ourselves present at a sad event as we witness the final weeks in the life of a young woman. 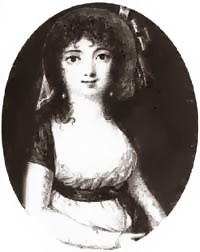 Eliza Poe lived a turbulent personal life just enjoyed a successful stage career; mother to three children, one of them would go on to become an iconic author in his own right. British-born Eliza arrived in America at the age of nine and since that day spent virtually all of her life touring the country as an actress. When she was orphaned prior to reaching Eliza was left to live with her a theatre troupe, the Charleston Comedians. By the age of just 18,the young woman was already a widow and within the year she had married again, this time to David Poe Jr. The family experienced ongoing financial problems despite Eliza's popularity as an actress and singer. Poe abandoned Eliza in 1809 and she travelled on without him, caring for her three children as best she could. In 1811 Eliza and the children arrived in Richmond, Virginia, with her three children and she took a role in The Stranger, boarding with a theatrical family named Usher. By October of that year she had begun to cough up blood and though she attempted to continue to perform, as the month wore on it became apparent that Eliza was suffering with tuberculosis. Soon she was no longer strong enough to appear on stage, giving her final performance on 11th October 1811. The people of Richmond followed reports of Eliza's decline in a local newspaper named The Enquirer and, on 29th November, the Richmond Theater hosted a benefit performance on behalf of the ailing actress and her young children. However, despite the kindness of the Ushers and the concerns of both the public and her theatrical peers, there was nothing that could be done for Eliza Poe. She lingered on into winter and passed away on the morning of 8th December 1811, surrounded by her children and aged just 25. Following their mother's death the youngsters were split up and sent to live with various families. Her son, Edgar Poe, took up residence with John and Frances Allen in Richmond and eventually his fame would eclipse that of his theatrical mother. In death Eliza was to face one final challenge when the authorities of St John's Church proved reluctant to allow an actress to be buried on consecrated ground. Luckily her cause was taken up by John Allan, guardian to young Edgar, and the young woman was eventually laid to rest in St John's churchyard at midnight, the final act of her short life. Today, she might have been save. Sad. Very likely, it's such a sad story! Thank heaven for antibiotics! And hadn't she already passed the infection on to her son? Didn't Edgar Allen Poe die of "consumption"? I believe there is some mystery surrounding Poe's cause of death though I am far from an expert; if anyone can advise further, I would be fascinated to read. I have seen it suggested somewhere (I cannot recall where!) that Edgar Allen Poe died of diabetes, a condition not understood at the time. A number of people who reputedly "died of drink" may have suffered from the condition which presents itself with intolerable thirst.